NEW: Negoatiation Strategies for Supply Chain Professionals course available starting Spring 2018! You can improve all your professional abilities faster with CITT's CCLP (CITT-Certified Logistics Professional) program of study. As a learner taking courses towards the CCLP designation, you can be confident you’re getting the most comprehensive depth of technical education available with courses that compress well over 20 years of experience into five interlocking, progressive courses designed and regularly updated to develop and deepen your supply chain logistics expertise. And if you don't already have a business degree or diploma, CITT also offers world-class general business management courses to round out your competencies. What’s more, industry’s most respected professional designation may be closer than you think. For those who do have business degrees or diplomas, advanced standing and course exemptions are available. Professionals with 10 years of senior management (director level of above) experience may be eligible for the Senior Executive Fast Track (click here to learn more about your fast tracking options). And if you have three years (or more) of experience working in the sector, you’ve already completed the practical requirement to earn the CCLP (CITT-Certified Logistics Professional) designation. All candidates need to develop and demonstrate their supply chain logistics expertise by successfully completing CITT's 5-course suite of specialized logistics courses (either online through CITT or with one of our official academic partners) in order to earn the CCLP designation. CCLP candidates take 3 core courses, plus 2 electives. All can be completed online, in as little as 12 months. Click here to learn more about CITT's specialized logistics courses. You can take these courses if you don't already have a business degree or diploma, have gaps in your resume or just want to sharpen your general management skills. You only need to take 5 (or provide proof of equivalency) to complete the business management education/ability requirement for the CCLP designation. But take as many as you want for your professional development and to prepare yourself to succeed in CITT's elective advanced logistics courses. Click here to learn more about business management courses offered through CITT. Note: there is also a practical experience requirement to earn the CCLP designation. 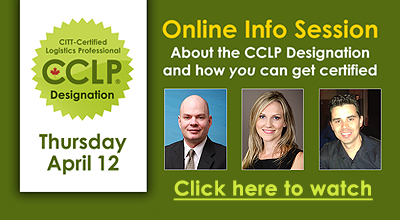 Click here to read about all the requirements to earn the CCLP designation, and here to learn about what you'll need to do to maintain your CCLP designation throughout your career.